In the inaugural races of the AMA’s “Basic Twins” competition, Shayna Texter of Willow Street, Pa. put on a dominating performance. Shayna rode the Racing Unlimited Kawasaki/Weirbach Racing motorcycle to victory, each day. On Saturday, Miss Texter’s lap times were faster than those of the “Expert” class which followed. The margins of victory were over 11 seconds on Saturday, and over 4 seconds on Sunday. 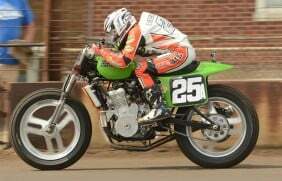 Saturday’s race marked the first time that a female has won an AMA National event, on a twin cylinder bike. Racing Unlimited Owner Alan Rodenborn said: “Shayna is an amazing talent. It’s no wonder, she has such a huge and loyal fan base. Guest rides rarely end up with this kind of success. Shayna put an amazing ride, on our bike! We built this bike for our regular rider, Natl expert #27 Robert “Bugs” Pearson. Rob had a commitment on another bike, so Shayna got the nod. Thanks so much to all of our sponsors.